Are you looking for a way to help your kids connect with their math facts? Consider these ‘Make 10’ DIY kindergarten math worksheets you can make and do at home. Cut candy corn shapes out of orange, yellow and white paper. On the top white part of the candy corn, write the number 10. Then, on the middle and bottom parts, write two numbers that add up to 10. Make several candy corn shapes with different addition facts that make 10, and mix them up. Have your child fit together the matching pieces. If your child is having trouble with this activity, add dots to the yellow and orange ends that the child can count. Remember, kindergarten math worksheets and activities are more about teaching what the numbers mean than memorizing math facts, so counting is not a problem. Write the number facts that add up to 10 on a sheet of paper. On a colored paper, trace your child’s hands and cut out the traced hands. Glue the paper hands to the top of the worksheet, leaving the fingers unglued so they can move. The children can then practice the math facts using the 10 fingers as counters, bending down the fingers as they add up to 10. Write some sums that add up to 10 on a large paper, leaving one of the ends off, such as “1 + _ = 10.” Give children clothespins that have the remaining number on them, instructing them to clip the correct clothespin on the paper underneath the problem that they fit. So, on “1 + _ = 10,” the child would clip 9 to the problem. Create a worksheet that uses pictures of cars to teach 10s. In one box, place pictures of cars, never more than 9 cars in the box. Have a blank box next to that one for the child to write the number. Tell your kindergartener that your cars want to have a race, but they cannot start unless there are 10 cars. Have the child write the number of cars needed to make 10 in the blank box. Use small car toys as manipulatives if needed. 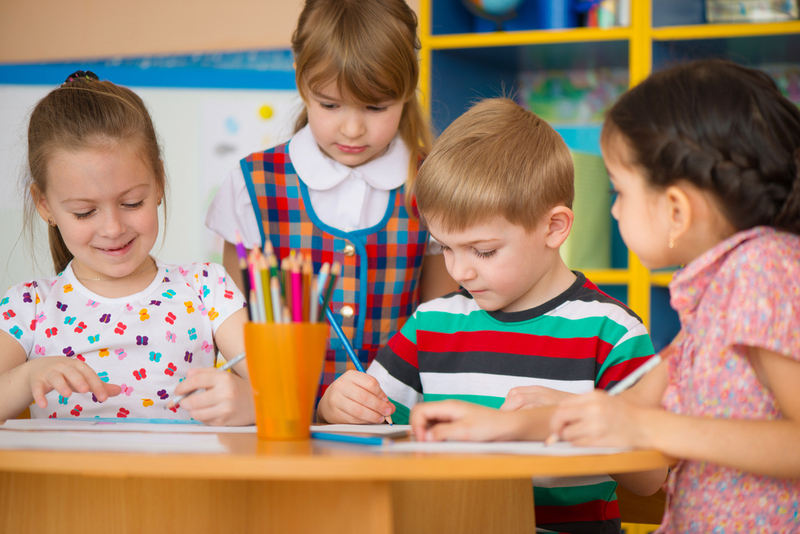 Creating your own kindergarten math worksheets can be a fun way to reinforce what your children are learning in school. If you want further reinforcement as you work to help your children get the best possible start in school, consider Thinkster Math, the powerful tablet-based math learning system customized for your child by a dedicated teacher. The program get instant feedback and rewards to keep them engaged and motivated, while also giving them instruction from experienced teachers who want to see them succeed. Proven to be more effective than a math tutoring center, Tabtor is what you need to develop academic confidence and success in life. Looking to help your kindergartener learn their math facts? Here is an example for teaching ways to make 10. Implement these for other facts as well. Next ArticleHow to Make Kindergarten Math Worksheets More Fun!